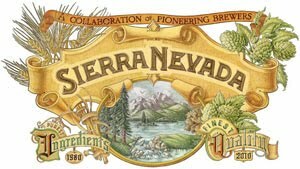 Sierra Nevada is celebrating its 30th anniversary this year by releasing a series of four different beers that are collaborations between Ken Grossman and a brewing pioneer. The second beer in the series brings the Sierra Nevada CEO together with Charlie Papazian of the Brewers Association and beer writing legend Fred Eckhardt to make an Imperial Helles Bock. Charlie, Fred & Ken's Bock is an 8.3 percent alcohol by volume beer that pours a bright brass color with a lacing white head. The beer has a nice malty aroma and the first sip carries the sweetness forward. The beer is medium bodied, but coating. The hops are subdued, which is true to the style with just a slight spice note at the finish.